Sir:—Two acts of the Legislature, of the fourth and twelfth of August, of which I inclose you copies, authenticated according to law, empower the President to cause to be borrowed on their behalf fourteen millions of dollars, subject to certain restrictions and qualifications, to be applied in payment of such part of our foreign debt as shall have become due, and to a new modification of the remainder, if it can be effected upon terms beneficial to the United States. The execution of this authority he has committed immediately to me, and ultimately through me to you; except as to three millions of florins, part of the above sum, of which, as you are informed, a loan has been anticipated by Messrs. Willinks, Van Staphorsts, and Hubbard, and of which a confirmation, with correspondent powers, has been sent directly to them. Among the documents which accompany this letter you will find a copy of the commission from the President to me, and a power founded on it from me to you. It remains for me to give you some indications for your government, conformable to the general tenor of the instructions which I have received from the President, and of which I transmit a copy; premising that it is understood, between the Secretary of State and myself, that you are to proceed to Amsterdam without delay, and to continue there, in the first instance, for a term not less than three months. A primary and principal object of your attention will be, to acquire as exact knowledge as may be of the footing upon which the different foreign powers who borrow in Holland have usually obtained their loans, since the commencement of our independence, and upon which they at present obtain them; the prices of foreign stock in the Dutch market, including our own; the state of our credit compared with that of other nations; the extent and the conditions to and upon which we shall be likely to borrow in case of war between England and Spain, and in the alternative of our being ourselves at peace or war; the principal houses and brokers concerned in the negotiations of foreign loans; their characters; comparative solidity and influence with the money-lenders; the terms upon which their agency is afforded to their employers; the manner in which those whom we have heretofore employed are understood to have conducted themselves in relation to our interest and credit; and particularly their solidity and influence with the money-lenders. Most if not all these inquiries will be immediately serviceable to you. They will all be productive of information useful to my department; and I will therefore thank you for successive communications of the result. One consequence of them to you will be, that they will enable you to judge whether our confidence in our former commissioners or agents ought to be continued, or withdrawn in order to the substitution of others; or, if continued, whether the terms of their agency may not be meliorated; or whether, with their consent, some other house or houses may not be combined with them, with an increase of credit and resource to us. These, as you will be sensible, are delicate points. They are, however, left to your prudence and discretion, according as facts shall be ascertained to you. I shall only remark, that changes of public servants ought never to be made but for cogent reasons. If lightly made, they are not only chargeable with injustice and are a symptom of fickleness in the public counsels, but they destroy the motives to good conduct, and, in money concerns especially, are apt to beget a disposition to make the most of possession while it lasts. Circumspection in the present case is also recommended by the consideration that those whom we have heretofore trusted risked themselves and their fortunes upon our affairs, when the doing it was not without serious hazard. This is a reason for permitting them to reap the benefits of our more prosperous days, if they have been faithful and are adequate to the trust. A further reason is, that they are now deeply interested in our funds, and consequently, it is presumable, in our credit. Competition and variance once existed between the house of Willinks and that of the Van Staphorsts; but these appear some time since to have been compromised. The latter have most merit for early exertions, the former are said to be most solid. This union is desirable for the greater security it affords. Suggestions of this nature are not dictated by any distrust of the fidelity or good conduct of our former commissioners. As far as I know, they deserve well of us. My object is, in entering upon a new stage of our affairs, to have the ground over which we have passed well examined, that we may the better judge whether to continue or alter our course. In the consideration of our foreign debt, it naturally divides itself into two parts; that which is now payable, and that which will be payable hereafter. The first we are bound to discharge as soon as may be, and upon the best terms we can. The last we are not bound to discharge but as the times of payment elapse, and therefore are not called upon to do it unless some positive advantage accrues from it to ourselves. This view of the matter governs the instructions of the President to me, which, of course, regulate mine to you. You are accordingly to borrow, on the best terms which shall be found practicable, within the limitations prescribed by law, such sum or sums as shall be sufficient to discharge as well all instalments or parts of the principal of the foreign debt, which now are due or shall become payable to the end of the year one thousand seven hundred and ninety-one, as all interest and arrears of interest which now are or shall become due in respect to the said debt to the same end of the year one thousand seven hundred and ninety-one. 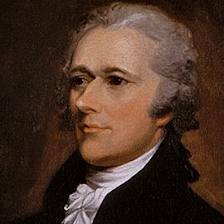 But you shall not extend the amount of the loans which you shall make or cause to be made beyond the sum which shall be requisite for that purpose, unless it can be done upon terms more advantageous to the United States than those upon which the residue of the said debt shall stand or be. And in order that you may judge what will be due to the end of the year one thousand seven hundred and ninety-one, I refer you to the papers marked A and B, which contain statements of principal and arrears of interest of our foreign loans to that period; and shall, by the next opportunity, send you a copy of the contracts respecting them, from which you will derive a more accurate knowledge of their terms. You will perceive, by the act which authorizes the loan for paying off the foreign debt, that there is no other restriction as to the terms except that, in the contracts to be made, the United States shall be left at liberty to reimburse the sum borrowed, within a period not exceeding fifteen years. As this seems to be the usual period for the reimbursement of moneys borrowed in Holland, that restriction can constitute no embarrassment. In the second act there is no restriction as to time of repayment, but there is one as to the rate of interest, which must not exceed five per cent. This, however, I consider as compatible with the allowance of those premiums, commissions, and other charges which are customary in ordinary times; and which, I am informed, are, in the aggregate, about four and a half per cent. But the allowance of unusual or extraordinary premiums to obtain loans upon a nominal interest of five per cent., as well because it is a pernicious mode of borrowing as because it would be an invasion of the law, is inadmissible. If war should continue or become more general in Europe, it is to be apprehended that the demand for money will raise its price upon us, and that loans will not be practicable upon so good terms as in time of peace. The situation of this country, too, authorizes us to expect that as our resources become more unfolded and better understood, we shall be able to borrow upon easier terms than we have at any time heretofore done. On both these accounts it would be very desirable, while we did not oblige ourselves to reimburse the principal borrowed in less than fifteen years, commencing at the end of ten, that we could stipulate for a right of reimbursing it sooner,—that is to say, either upon giving notice of our intention to do it for a limited time beforehand, or at the end of a short period, say five years. I should consider a stipulation of this kind as a valuable ingredient in your contracts. I have intimated above the inexpediency of extraordinary premiums to purchase a nominal low rate of interest. Against this error I would particularly guard you. It is sacrificing a real future interest to an appearance, at best, to temporary accommodation. A higher rate of interest upon a sum actually received, is preferable to a lower rate upon a nominal sum, with large deductions in the first instance, or considerable premiums afterwards; this will be more especially the case if we can reserve a right to repay when we please or after a short period; as we may reasonably contemplate, with the return of peace, a fall of interest. But every thing of this kind is, after all, matter of calculation, and to be tested by the evidence of figures. I can only, therefore, mean to give you a caution, referring you to that test, and intimating to you this general principle, that the name of a low interest ought not to betray us into giving more for it in the shape of premium or discount than it is worth, and that, as we shall borrow at a time when circumstances will render interest high, we had better pay that interest on actual value received, than a lower one on a fictitious value, or for future and exaggerated compensations; reserving, as far as it can be done, the right of paying off at pleasure, or at an early period. The future fall of interest will, in the first case, turn to our advantage, in the last, to our disadvantage. You will not pass unnoticed the circumstance that the laws contain actual appropriations of very adequate funds for the payment of interest upon the sums you shall borrow. The first act, indeed, after reserving six hundred thousand dollars for the support of government, gives a priority in payment to the foreign debt out of revenues which are calculated upon the estimate of a much larger product. You may confidently assert that the duties hitherto have produced at the rate of one million eight hundred thousand dollars; which alone would leave twelve hundred thousand dollars, as the fund out of which the interest on your loans would be payable. But the augmentations which have been made in the rates are computed to be capable of affording an addition of eight hundred thousand dollars; and I believe the computation to be well founded. You will also, no doubt, make a proper use in your communications of the actual situation and future prospects of this country. The economical scale of our establishments, civil and military; the comparative smallness of our debt; the reliance which may be had on the stability of our pecuniary arrangements once made, from the nature of our government in respect to the mutual checks inherent in its organization; the rapid progression of population and resources to which we may look forward; the actual and probable emigrations occasioned by the troubled state of Europe; the hope that we shall continue in peace, while other Powers are accumulating their debts by new wars; the very favorable situation in which we shall find ourselves at the end of a general war in Europe, if we avoid participating in it, etc., etc. These are topics which ought to have weight in our favor, and, within due limits, may be urged with force and assurance. With regard to that part of the debt which does not become payable till after the year one thousand seven hundred and ninety-one, you will have observed that nothing is to be done by you in respect to it, unless it can be done upon terms of advantage to the United States. However cordial our disposition to come to the pecuniary aid of France in her present affecting and embarrassed condition, in this early stage of our finances we could not in prudence volunteer payments not due by the terms of the contract, especially, too, by the expedient of new foreign loans, unless it should be attended with some circumstance of advantage in the operation to ourselves. By this I understand a lower rate of interest. For, according to my speculations on the probable rate of exchange between this country, France, and Holland, and between Holland and France for some years to come, I deem it better (whether our payments proceed directly from hence, or circuitously through Holland) to have to pay a given sum to France, than an equal sum to Holland. The charges too upon the new loans will have to be taken into the account, and an indemnity for them included in the terms of the operation. Calculating only upon the ordinary ones, it does not appear to me that it would be the interest of the United States to change the form of this debt, unless the rate of interest on the new loans did not exceed four per cent. And I own that, in the present aspect of affairs, I see no ground to expect that loans will be obtained at so low a rate. If the thing should be possible, it must be on the score of some collateral advantages to the lenders; such, for instance, as their being permitted to pay a part in the effects or stock of France, as was contemplated in the last negotiations. Whether any arrangement of this nature will be a desirable accommodation to France; whether persons of real capital, who would not in the execution be obliged to use means prejudicial to the credit of the United States, would be willing to embark in such a plan; whether it would prove an obstacle to other loans which we may have occasion to make for other purposes, are circumstances essential in determining its eligibility, which cannot be known to me, and can only be accurately judged of by one on the spot. I suggest them as hints to you. In exploring or feeling the ground, you will recollect that propositions of such a nature ought not to come from us. If the thing should be capable of being placed upon a footing conducive to our interests, we ought only to appear to sanction what other parties desire of us. And we should in no event make any movement that may injure our reputation, or place us in the light of a people desirous of making hard bargains at the expense of friends. Neither can I authorize you to conclude any general arrangement of this nature, without a previous communication of it to me, to be submitted to the consideration of the President; there being a separate instruction from him to me, that no loan shall be opened for more than a million of dollars, and that no new loan shall be undertaken until the preceding one shall have been announced to him, and shall have received his sanction. This limitation, therefore, in all your proceedings, you will of course attend to, and you will perceive the utility of making the earliest communication of every loan you shall set on foot, in order that you may know the determination of the President before its completion, and be prepared in time to commence another. It has been suggested that loans may be made with advantage in certain parts of Italy. I do not count on this resource, but I shall be glad to know how far, from inquiry, it shall appear to be an eligible field for an experiment. With regard to the application of the moneys to be borrowed, you will, from time to time, receive special directions. The foregoing are the only observations which the time I have will permit me to make. They contain general indications of the course you are to pursue; the rest must be left to your judgment, circumspection, and delicacy. I doubt not you will be duly impressed with the importance of the trust; how much the interest and reputation of our government are concerned in its proper execution. And I feel a confidence that they will not suffer in your hands. P. S.—I send for your information a copy of my letter to Messrs. Willinks & Co., by which you will perceive the footing on which the provisional loan of three millions of florins is placed. * This letter contains the general instructions of the government as to our financial policy abroad, including both payment of French debt and the management of Dutch and other loans.